The church of Saint John the Forerunner is located just few km outside the village of Stylos in the Apokoronas province of Chania at the position ‘Platanakia’. The church was built in 1898 in this natural paradise valley with many old plane trees and citrus farms. It is a one-aisled chapel that celebrates on August 29 every year with a big feast (in Greek: ‘panigiri’) after the liturgy. 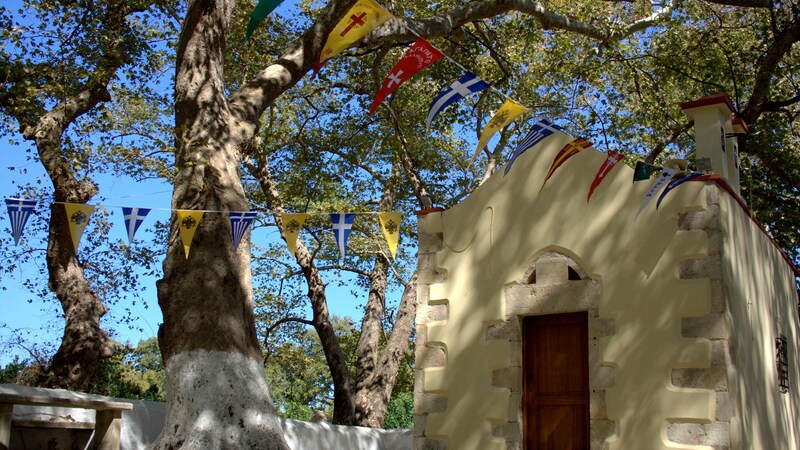 Around the church there are many plane trees with very large trunks which offer shade to visitors and there are benches and tables making the place ideal for picnics. Next to the church there is one of the of the Kyliaris River springs surrounded by gardens, plantations and orange groves. From the chapel you can follow the path formed along the river to the springs in the village of Stylos through lush vegetation, water mills and canals. In recent years there is a run of 8km around the Kyliaris River organised by the Health Runners Club of Chania. Kyliaris is the second river in water quantity in Crete being stable all year round. Before the Second World War the village of Kalyves was powered by the hydroelectric installations of the river. The area is very beautiful and a true oasis especially in the middle of the summer heat.